Whether you’re planning a movie date with your special someone or a family movie outing, you don’t just want to see a movie; you want a memorable experience, too. Where better to watch a movie than right here in Los Angeles? Los Angeles movie theaters are some of the most famous in the world. Here is our list of the Best Places to See a Movie In and Around Los Angeles. Since 1923, the Vista Theatre has been serving as a popular spot for movie-goers. Audience members will enjoy a 50-foot screen and “the most legroom in Hollywood.” You’ll also find celebrity footprints in the theatre’s forecourt (including those belonging to Spike Jonze, Joseph Gordon-Levitt, and John C. Reilly among others). You may feel as if you’ve stepped back in time to the days of classic Hollywood, while enjoying a current film and state of the art Dolby Digital JBL Sound. Loyal patrons speak highly of the affordable concession and ticket prices too. Originally opened in 1926, the El Capitan has been restored to provide all who come a completely enchanting movie-going experience. In addition to state-of-the-art cinematic technology, the El Capitan also usually includes pre-show entertainment as well as prop and/or costume exhibits. Many Walt Disney Pictures feature films have their premiers at the El Capitan. Audience members may also be treated to a pre-movie performance of the 4/37 Wurlitzer organ, considered to be the top of the line in theater organs. 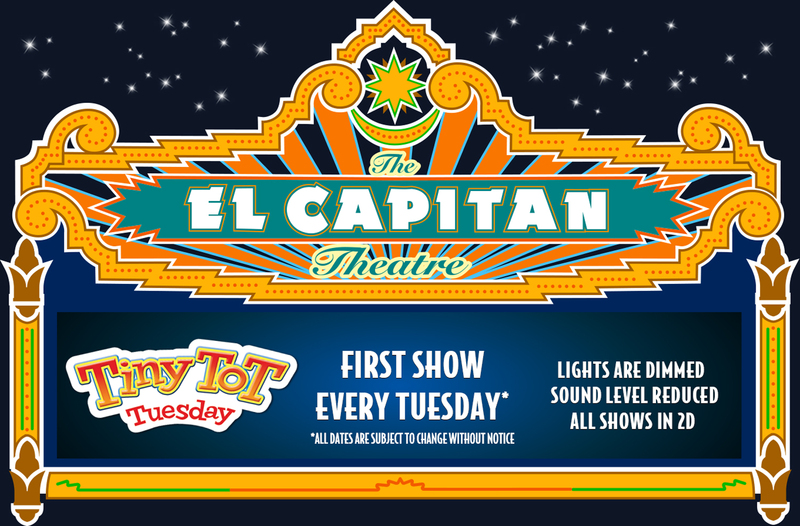 Families will also appreciate the Tiny Tot Tuesday program – each Tuesday, the first show of the day is shown in 2D, with dimmed lights and reduced sound levels. Currently, the El Capitan is screening “throwback” films such as Flubber, Up, and Hocus Pocus among others. Throwback films come with special pricing ($10) which includes a reserved seat, small popcorn, and small drink. Check the website for dates and to purchase tickets. You’ll find the Regal L.A. Live Theaters in the heart of downtown, steps away from the Staples Center, the GRAMMY Museum, and all the other offerings at L.A. Live. It’s a great spot for a date night – dinner, movies, and strolling all in one spot. You’ll find stadium seating, reserved seating, and what some describe as the “most technologically advanced movie theater” offering “movies in laser, immersive sound, integrated digital lobby displays, and more. Be sure to check the website for parking information. (Regal will validate for patrons parking in Lot 4). The Village – Westwood Village Theater is a part of the Regency Theatres group. Located minutes away from the campus of UCLA, this particular venue also hosts many movie premiers. And, like in the “old days,” this theater shows one movie at a time. Patrons speak highly of the discounted prices for college students and the reasonable cost for concessions (relative to other theaters). Perhaps one of the most famous movie theaters in the world, TCL Chinese Theatre hosts movie premieres, ceremonies, and film festivals along with regular movie showings. The theatre now also hosts an IMAX auditorium as well. Grauman’s Chinese Theatre originally opened in 1927 and at the time the United States government had to authorize the importation of temple bells, pagodas, and other artifacts from China. The Theatre is also famous for its collection of cement handprints and footprints out front, attracting millions of visitors each year. You’ll find the AMC Century City 15 inside the Westfield Century City Mall. Moviegoers will appreciate the convenience of having reserved seats as well as knowing that their movie experience includes “powerful images and sound technologies combined with cutting-edge, reserved recliners.” Certain movies are also offered in the IMAX Theatre at AMC. Additionally, you’ll find much more than your standard fare of popcorn, soda, and candy here. AMC DINE-IN gives you “the best of both worlds – a restaurant and movie theatre rolled into one.” The menu includes entrees, appetizers, and desserts and is all made in-house. (AMC also validates for 3 hours of parking in the mall’s parking structure). At the Pacific Theatres at The Grove, you’ll find a “14-screen art-deco influenced movie theater offering advance ticket ordering and reserved seating.” Enter into a “lofty large foyer, with a grand sweeping staircase” and you may feel as if you’ve entered into a movie theatre of the past. Pacific Theatres at The Grove offers stadium seating and Monday Morning Mommy Movies. There is also a full-service bar on-site as well. Head to the movies at the popular Universal CityWalk and “see movies where movies are made.” Moviegoers will enjoy reserved seating, AMC Signature recliners (they come with seat warmers too! ), and cocktails at the Director’s Lounge (featuring an exclusive drink from Mario Lopez). (Recliner seating is not available in IMAX). General parking at Citywalk is $25; however, the box office will provide you with a $20 refund with the purchase of a movie ticket. You’ll find the 12-screen Landmark in the Westside Pavilion. The Theatre is the “largest independent movie theatre in the country.” The theatre offers stadium seating, more than your standard fare concessions (including a wine lounge known as The Landmark Lounge), and spans two levels. Additionally, parking is free for three hours. ArcLight strives to be “more than a place to see a movie; it is an experience.” Guests will enjoy reserved seating; seating that is “three inches wider than standard theater seats, with double-wide arm rests, and an average of 46” of legroom.” In addition to popular, blockbuster movies ArtLight also screens speciality films, retrospectives, limited releases, Q & A events, and more. The ArcLight also has a Café and Bar on site as well. ArcLight Hollywood is located adjacent to the famous Cinerama Dome which is now also part of the ArcLight complex.